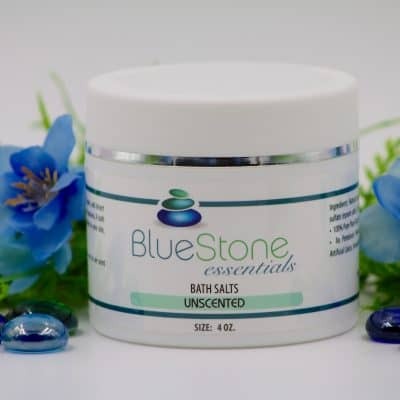 BlueStone Essentials’ Lavender bath salts are infused with 100% pure therapeutic grade Lavender essential oil and, is beneficial for relieving stress, anxiety, and may help improve circulation and support hydration. Run a nice warm bath, add BlueStone Essentials’ Lavender bath salts and slip away to a state of peace and calm. 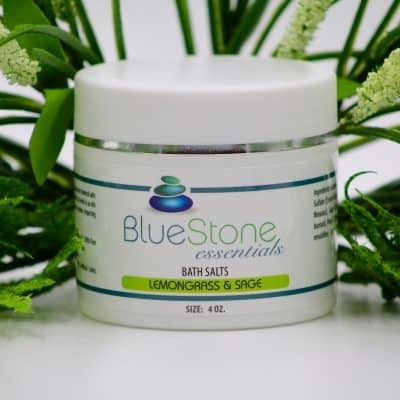 BlueStone Essential’s Lavender Bath Salt combines the therapeutic properties of Dead Sea, Epsom, and desert mineral salts with pure therapeutic-grade essential oils to create a deeply penetrating aromatherapy bath salt which is as rich in minerals as it is luxurious. A bath enhanced with one of our bath salts will make ritual of routine, impart softness to your skin, refresh your body and leave your senses uplifted and at peace. Ingredients: Natural Sea Salt, Dead Sea Salt, Sodium Bicarbonate (Baking Soda), Magnesium Sulfate (Epsom Salts), Pure Therapeutic Grade Essential Oil Blend: Lavender (Lavender angustifolia), Lavendin (Lavendula burnati), Sweet Orange (Citrus Senensis), Geranium (Pelagonium graveleons), Cedarwood (Juniperus virginiana), Spanish Marjoram (Thymus mastichina), Frankincense (Boswellia carterii) Sulfonated Castor Oil (Natural emulsifier) Certified Organic by Quality Assurance International.